I first met V is for Villains a little less than a year ago when we were hosting a table at Wizard World Chicago. The band had taken it upon themselves to dress up in their lavish outfits and walk amongst the geeks and world of fandom to promote both their theatrical antics and their heavy, industrial rock sound. They made a splash to say the least. It goes without saying that V is for Villains is gutsy. In a time when few underground bands are willing to be cartoonishly theatrical AND pop-like the Villains definitely stand out. I’ve seen their live shows (full disclosure, I’ve also DJed and booked them) and I’m consistently impressed with the tightness of their performance and the energy they bring to the stage. Yet great skill in live performance a great studio album does not necessarily make (and vice-versa, I’ve sadly learned). So I was both excited and feeling trepidation about what I would find on the Villains debut album “Evolve or Die“. What I ultimately did find was a solid record. Though hardly perfect, it’s a tightly wound and entertaining debut and shows promise for a group that’s already wowed steampunks, metal-heads and industrial fans. Written and produced by front man Mr. Agitator (aka Nick Santiago), it’s a truly independent album. Santiago has years in the music production business and the finely polished production and mastering of the album shows his experience. Yet, it also has the stripped down and relatively repetitive elements one would expect from an independent record. Santiago is very obviously playing with a coterie of equipment and themes, and this is both the great strength and weakness of the album. Strength wise this is a beautifully polished and thematically tight album. Lyrically it plays on ideas of alienation and frustration that one may expect from the bands “characters”, all supposed super villains. This helps waylay what initially sounds a bit too angsty into something almost more like a rock opera. The dark, brooding electronics help to elevate this, and the layered vocals add an almost operatic quality to it at times, such as on the title track “Evolve or Die” or in “Rise Above”. Meanwhile some songs could practically used for a movie soundtrack, such as the finale track, “March of the Villains”. The only real qualm I have is that the record becomes sonically a bit repetitive. I say that with a grain of salt though. I’ve heard many heavily electronic albums where every song is so audibly alien to the previous that it feels more like a compilation than the work on one artist. In that respect Santiago does very well keeping Evolve or Die thematically in-line. Yet some songs like “A Strange Place” can be exhausting, playing a bit too ham-fisted into the same themes of the frustration of unrequited love and/or abandonment while sonically changing very little. It should be noted that V is for Villains has been around not even a full year, and Santiago has done a splendid job creating a basis for an act that is truly as much theatrical as it is aural entertainment. At the core there is an obvious tongue firmly wedged in cheek, though I might like to see it a bit more clearly in follow ups. I would suggest this record especially to the young fan of hard, heavy and emotionally charged industrial and dance rock. I’d also suggest it to older fans who miss the over the top antics of mid 1990s performers like White Zombie or Marilyn Manson (though the Villains aren’t quite so shock oriented, and I say: thankfully). Steampunk-wise their heavy sound and theatrical take on stage performances quite fit the bill. 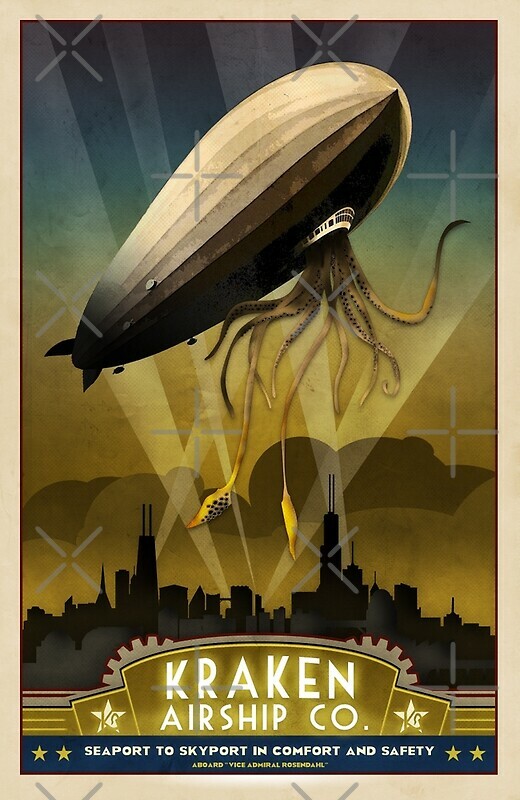 Though should you be looking for an album full of gears and airships you’ll be out of luck. That said, I’m fine leaving my airship in the dock and the gears at home. V is for Villains’ Evolve or Die launches on Amazon or iTunes June 5th.